These are not just doughnuts. These, my friends, are a chocolate experience. 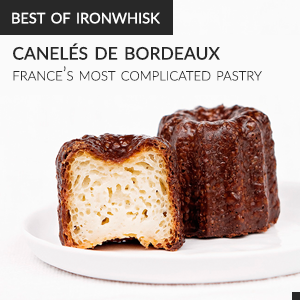 A chocolate experience that is surprisingly easy to make. I learned something new about doughnuts while making these. I used to think that there were two types of doughnuts: cake doughnuts, which were baked, and yeast doughnuts, which were fried. I now realize that you can fry cake doughnuts and bake yeast doughnuts. Cake doughnuts are simply doughnuts that use a leavener other than yeast, like baking soda or baking powder. This is huge news – it means double the types of doughnuts! This revelation also means that you can spend only a couple of minutes making cake doughnut dough and prepare it without any special baked-doughnut pans. Instead, you can use delicious, artery-clogging oil. These delightful fried doughnuts are cake doughnuts. If you are scared of yeast, which is totally understandable since it is one of the few ingredients that literally hisses at you, it doesn’t mean you have to be scared of making doughnuts anymore! I do like the taste of fresh, yeast-leavened doughnuts slightly more than “cake” ones (that’s why I made buttermilk beignets, vanilla doughnuts, and banana-caramel doughnuts), but there are so many great benefits to cake doughnuts. Naturally, they are easier and quicker to make: the prep time for this recipe is less than half an hour. Another really great benefit to making cake doughnuts is that they don’t go stale as quickly. Yeast-leavened doughnuts (unless they are loaded with preservatives) go stale in usually just a couple of hours. Cake ones stay fresh for a couple of days, as long as they are well covered. After frying the doughnuts, I dipped them in a rich chocolate glaze. This glaze is unbelievably easy to use. I sometimes have trouble getting regular icing sugar – milk/water glazes the right viscosity so that there is a thick coat on the doughnuts, but this glaze comes free of such issues. It also dries really smoothly, which is great. Before the glaze set, I also made sure to sprinkle the doughnuts with cocoa nibs. The nibs added a little bit of a crunch to complement the soft, fluffy insides of the doughnuts. Super yummy. 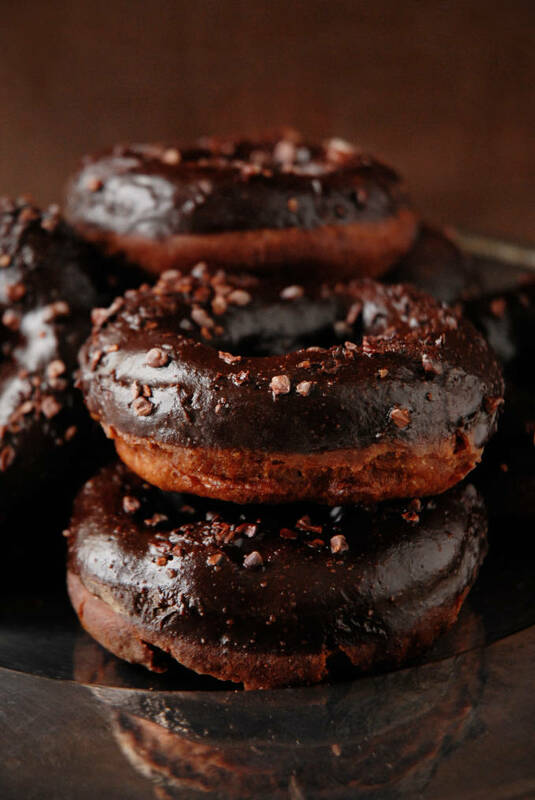 Rich triple chocolate doughnuts, dipped in a velvety smooth chocolate glaze and generously sprinkled with cocoa nibs. Recipe adapted from Naomi at Bakers Royale. Mix together the milk and lemon juice and let sit until the milk curdles, about five minutes. Mix together the sour cream and baking soda in a small bowl. In a large bowl, sift together the flour, cocoa powder, baking powder, and salt. Add sugar, the sour cream mixture, the milk, and the melted butter. Whisk until well mixed. Chill dough about 1 hour, or until it is easy to handle. Cut out two dozen squares of parchment paper slightly larger than the size of your doughnut cutter. On a floured work surface, roll out the dough to a ½ inch (1.2cm) thickness. Cut dough with a floured doughnut cutter, re-rolling dough as necessary. Use a large cup and a small cup, like a shot-glass, if you don't have a doughnut cutter. Transfer each doughnut to a separate square of parchment paper. Fry doughnuts, two or so at a time, in deep, hot oil (about 365°F) for 2 to 3 minutes, turning once. Using a slotted spoon, transfer to paper towels to drain. Combine the butter, milk, corn syrup, and vanilla extract in a saucepan over medium heat. Once the butter melts, stir in the chocolate. Once the chocolate melts, whisk in the icing sugar until smooth. 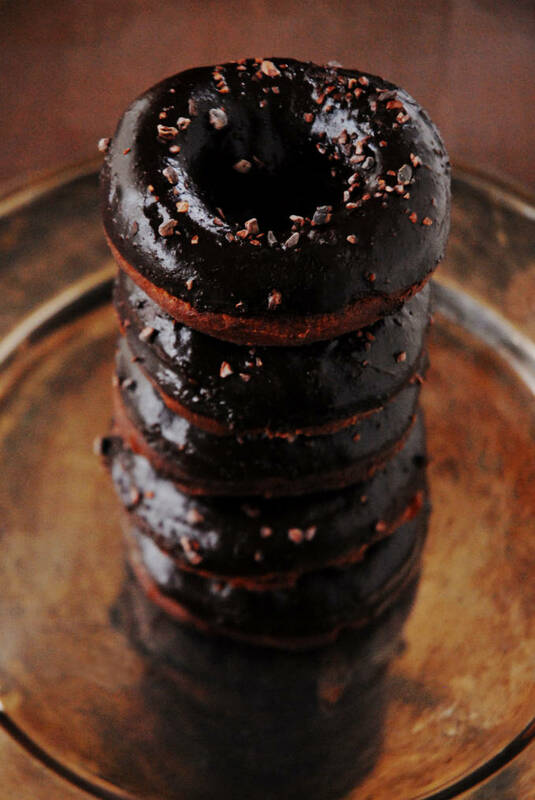 Dip each doughnut in the chocolate glaze, and then slowly raise the doughnut out of the glaze. Place the doughnuts on a tray. Sprinkle with cocoa nibs, and then wait about twenty minutes for the glaze to set before eating. Store in an airtight container. Oh my – these look sinfully delicious. It’s pretty dangerous that they can be ready so quickly! Wow Ilan! These babies are beautiful, and thanks for the info. I might have to give these a go. I want this chocolate experience!! :) I’m officially starving after looking at these scrumptious doughnuts. Fried. Cake. Donut. Mind blown. I had never even considered that as an option. These look amaaaaaaazing. Even though I’m not a huge fan of fried doughnuts, I was particularly drawn to these, they are really quite lovely and chocolatey!